Applications for Pave a Path Scholarship Are Open! As a social entrepreneur, you are a trailblazer and a changemaker. But in order to lead our world into a brighter future, you need someone to invest in you, as you invest in your community. That is why SEA exists: to provide access to resources, a solid network and a supportive community that enables you to grow your impact. However, we recognize that not all social entrepreneurs have equal access to those opportunities. The Pave a Path Campaign is a fundraiser that allows us to offer SEA membership scholarships to social entrepreneurs who face barriers to opportunity. In 2018, we welcomed our first Pave a Path cohort of 10 driven, talented, deserving social entrepreneurs. Now it’s time for round two! With the generous contributions of our community, we were able to raise enough to extend scholarships to 15 social entrepreneurs to join the SEA community! In addition, through our partnership with Greyston Bakery, 3 of those social entrepreneurs will also receive a scholarship to attend a powerful training at the Greyston Center for Open Hiring. 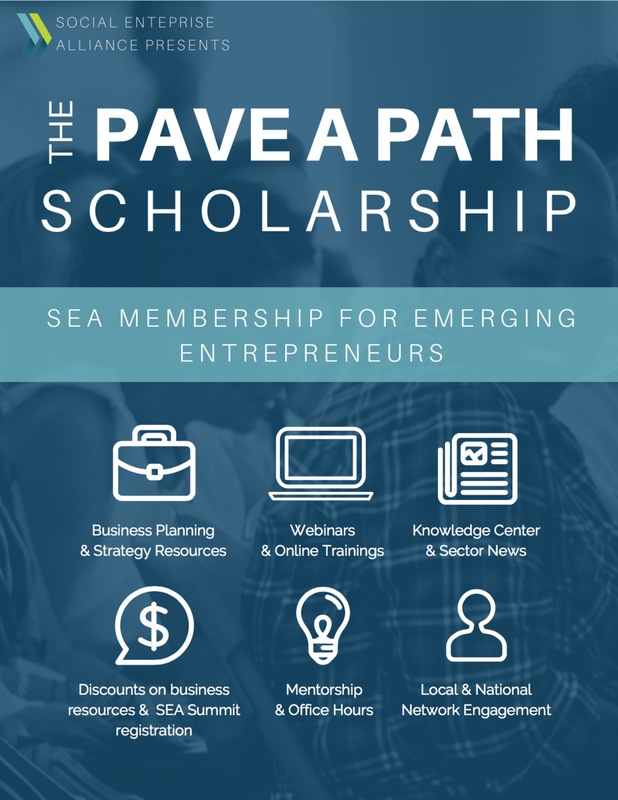 If you are a minority, female or LGBTQ+ entrepreneur or financially unable to afford membership fees, the Pave a Path Scholarship may be for you! See the criteria and apply by Sunday, February 24th for the chance to be a Pave a Path scholar. See if you are eligible! Pave a Path is made possible by contributions from our community. Thanks to our 2018 donors, we raised enough funds to offer 15 scholarships. To all of you who donated, shared the campaign or lent an encouraging word of support — Thank you. We appreciate your generosity and your commitment to helping us build inclusive pathways to success. If you’d like to continue to support the Pave a Path initiative, contribute here! Apply for the SEA Membership Scholarship!